One of the fastest growing segments in the camera market is the MILC/EVIL mirrorless interchangible lens cameras. Olympus and Sony are 2 of the biggest players in the segment, with Panasonic the other of the big names in the category, yet Nikon and Canon dont compete at all in this growing segment where typically it is mum n dad who want the capabilities of a D-SLR, but have never used one and dont want the size of even a small DSLR. Olympus re-incarnatred the legendary Pen line when they introduced the E-P1. 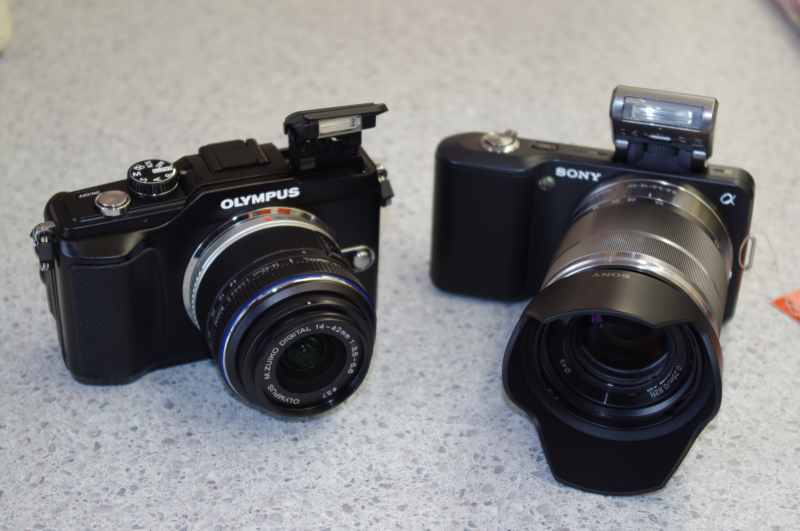 The Olympus Pens, and Panasonic’s Lumix G series cameras share the Micro 4/3 format, this has been designed as a digital standard and those who have used the 4/3 format Olympus E series D-SLRs can use their lenses with an adapter on Micro 4/3 cameras with no problems. Sony have designed the Alpha NEX series cameras as a little brother to the Alpha A series cameras, and as such again with an adapter, many A series lenses are compatible with the NEX cameras E mount. Spec wise the cameras are pretty similar, though the Sony has dual memory card capability, the HD video is 1080 HD compared to the 720P of the Pen and the sensor of the Sony is physically larger, and has a couple more megapixels over the Pen. I Could wax Lyrical about the design of both cameras, and all the differences, but i wont, lets just say the NEX-3 has less buttons on the back, and the screen on the NEX tilts out where the PEN almost feels cluttered with Buttons compared to Sony’s lack of and the screen is fixed in place, both have their advantages and disadvantages and it comes down to personal preference. Personally, im happy either way. Same goes with the Menu’s both are pretty good, though sony use big icons for menu subsections, where olympus go for lists.. and it comes down to what you prefer and find easier.